We are all mesmerized by the transformation of the caterpillar into the butterfly. Equally awesome, but somehow underappreciated, is the transformation of the world’s flowers into the seeds and fruit that we – along with the rest of the animal kingdom – depend on. How does this shape-changing process happen? It takes a boy and a girl and a gobetween in the form of a pollinator such as a bee. Well, sort of. The “boy” part of the flower produces that golden powder, which sometimes dusts your nose when you smell a flower, called pollen. Each grain of the golden dust contains a male gamete just itching to connect to the sticky stigma at the top of the “girl” part of the flower (the wooden-spoon-shaped pistil). The oval at the base is the ovule which transforms into seed or fruit. When that bit of golden dust alights on the stigma, it germinates and sends a microscopic tube down its length to the oval (ovule) base. Petals fall off and the transformation to seed or fruit happens. In terms of geologic time, flower power would not be a misnomer. In the geologic olden days, flowers helped transform our world from a world of green, giant plants and dinosaurs to a range of smaller trees and plants of myriad variety, dappled with color. And their partners-intransformation have been the ever-evolving pollinators: bees, flies, beetles, butterflies, moths, bats, birds and other mammals that came along to carry the pollen from plant to plant, creating greater genetic diversity through cross-pollination, transforming flowers into fruit. How do pollinators, those mostly miniature bits of flight, impact your life? Pollinators are responsible for one out of three bites of your food. What’s more, 90 percent of the world’s flowers require the “pollen airlift” they provide to produce seeds and fruit. Finally, these pollinators themselves are an indispensable food source for birds, animals and humans. They play a crucial role in the relationships that form the web of life. Is it going too far to say, “No pollinators, no people?” I don’t think so. Let’s focus on bees as pollinators. Though everyone is familiar with the honeybee, did you know that it hales from Europe and is not a native? More importantly, did you know that there are 4,000 native bees in the United States? Coming in a variety of colors, these bees can be black, metallic green, blue with stripes of red, white, orange or yellow. Three-quarters of theses bees are solitary, nest building bees. Only females sting, and their sting is minor. 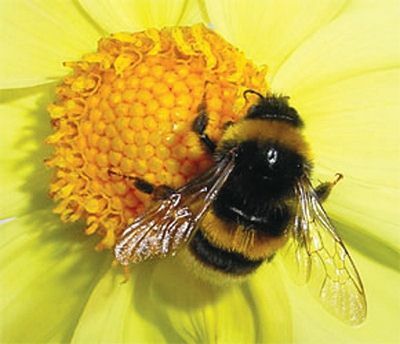 There are plasterer bees, leafcutter bees, mason bees, carder bees, digger bees, and carpenter bees. Let their names guide your imagination on how they construct their homes. Two-thirds of these insects nest in the ground and, like worms, they create tunnels that help improve soil texture, increase water movement and mix nutrients in the soil. Some bees are generalists, which means they visit a variety of flowers for pollen; others are specialists focusing on a single plant species or a group of closely related plants. Specialists can be most threatened by the stress of habitat degradation or fragmentation. Though flowers continue to bloom, seed production can decrease, and the change can go largely unnoticed. Bumblebees, of which we have nineteen species in Wisconsin and Minnesota, are generalists. They are active from February to November. Like honey bees, they are social bees, living in groups. Most are docile in nature. In other words, their buzz is worse than their bite. Though that buzz strikes terror into the hearts of many, it actually serves a pollinating purpose. Bumble bees h a n g on a flower such as Wisconsin’s native cranberry and buzz by vibrating their flight-controlling muscles. This shakes the pollen loose onto the bee, sort of like pollen confetti. The bee then grooms itself, putting the pollen in a concave hairless area, which is surrounded by stiff hairs on its rear legs, food for themselves and their offspring. What would you call these? Perhaps pollen baskets, or the more professional term, corbicula. How can we protect these floral catalysts we call pollinators? They are in danger from three major threats: herbicides, pesticides, land fragmentation. We need to reinvent how we develop our land and change our conditioned expectations of bigger houses on more land to reduce fragmentation. In our cities, our lawns, non-native ornamentals and hybrid flowers (especially doubled ones) do little to provide homes for these much-in-need-of-protection pollinators. We need to plant more native species, and reduce or eliminate pesticides if we want to protect this essential part of the ecosystem. Learn More: Enhance your ability to sustain native pollinators and plants. Join Jeff Karron at the UWM physics building on Cramer and Kenwood (Room 137) Fridays at 8 pm for Bumblebee Buzz: What’s Happening To Our Pollinators. Part of the UWM science bag series, it’s great for kids eight and above long with adults.